Before you read yet another biography of Shakespeare, please read this! It will be controversial in some quarters, perhaps, but it provides a very necessary corrective to the spate of recent studies. So little is actually known for certain about the details of Shakespeares life and yet so much has been built on the foundation of a few facts. This book looks at the way various writers and biographers through the ages and up to the present have used these to create and develop a national myth which says more about us and our pre-occupations than it does about Shakespeare. Appropriately enough, Shakespeares first appearance after his death was as a ghost: one of the glories of the past, he was summoned back from the grave to denounce the decadent present. It was only with the rise of the historical novel that efforts were made to provide the public with a more substantial image of their best loved writer. The difficulty which lay in separating the few known facts of his life from what E. K. Chambers so aptly termed the Shakespeare mythos was one which historical novelists were entitled to ignore, as were those dramatists who throughout the 19th and 20th centuries contrived have a character called Shakespeare tread the boards. But from the beginning scholars and biographers were in a different position and for the latter especially, the inscrutability which Mathew Arnold celebrated in his famous sonnet, was hardly an option. 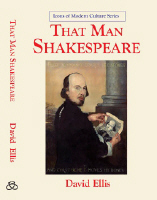 The various attempts made, in a variety of different media, to satisfy what was an ever-increasing public curiosity about Shakespeare the man are copiously illustrated in this book but it concludes with an analytic account of the methods contemporary biographers are obliged to employ in order to meet the demand for knowledge of his beliefs, attitudes and sexual preferences. The examples cited are a tribute to the four centuries of scholarly endeavour and imaginative insight which love of Shakespeare has provoked, but they also demonstrate that, where a national icon is concerned, whereof you do not know thereof you should not speak is advice which can but fall on deaf ears. The basis of the portrait is a phrenological drawing (1807) of what was supposed to be Shakespeares skull, attributed to the French natural scientist Georges Cuvier, when he was an admirer of the Viennese physician and phrenologist Franz-Joseph Gall. Rumour has it that this skull was taken from its original resting place by an infamous resurrection man (later transported to New Holland) who was acting on behalf of the businessman and amateur natural scientist, James Deville, and that Deville then carried or sent the skull to Paris. There it came into the possession of another admirer of Gall, Johan Kaspar Spurzheim, who later took it to America on one of his many lecture tours in that country. It has not been seen since.